ASUS RS700A-E9-RS4 is built on the brand-new AMD EPYC™ platform to deliver incredible server performance. With up to 32 cores per CPU and up to 128 threads in a single 1U server, RS700A-E9-RS4 packs incredible power in minimal space. 32 DIMM slots provide best-in-class memory capacity and bandwidth, and an integrated I/O controller on the processor eliminates the data transfer bottlenecks caused by discrete I/O chipsets for reduced latency and dramatically faster system performance. ASUS RS700A-E9-RS4 offers flexible expandability with one full-height PCIe 3.0 x16 slot (x16 mode), one low-profile PCIe 3.0 x16 slot (x8 mode), one low-profile PCIe 3.0 x8 slot (x8 mode), and one OCP Mezzanine 2.0 slot (x16 mode) for OCP LAN cards. These robust expansion options make RS700A-E9-RS4 suitable for a wide range of storage and networking applications, and provides high scalability in a 1U server. 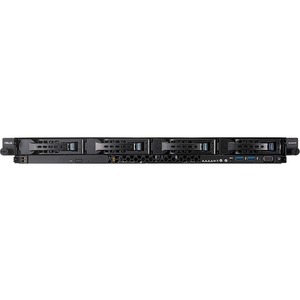 RS700A-E9-RS4 features numerous user-friendly design features that simplify server maintenance. Two M.2 slots that accommodate 22110-size SSDs for additional storage options. The server's Q-code is visible from the outside of the case to make diagnosing issues easier and more convenient. A tool-less rack rail kit is included for easy server installation and removal, and a tool-less, hot-swappable fan makes for faster and simpler maintenance. RS700A-E9-RS4 also features an energy-efficient design that eliminates the power-sharing board for reduced power consumption and operation costs.